Author: McMullen, Sean Set In . . .
Sean McMullen is one of the hottest new writers working today. He is a three-time winner of the Ditmar Award in his native Australia, and has also won that country's Aurealis Award. His last novel, Souls in the Great Machine, began the steampunk saga of Greatwinter and garnered him much critical acclaim. The Miocene Arrow continues McMullen's story of a far-future Earth flung back to its pre-technological roots. Ultra-light American diesel gunwings can hold their own against Australian human-powered battle computers and a tram-based net. But they are helpless against the ultimate doomsday machine: The Miocene Arrow. In a fortieth-century America of ancient kingdoms with opulent courts, hereditary engineering guilds, and rigid class distinction in warfare, a centuries-old balance of power is shattered by a few dozen Australian infiltrators. Against a rich backdrop of war, chivalry, conspiracy, and a diesel-powered arms race, a dangerous secret alliance has formed. 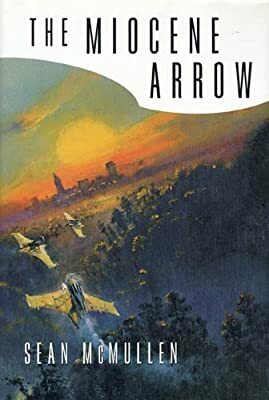 Now the unlikely trio of an airlord, an abbess, and a fugitive are joined together in a desperate race against time to stop the Miocene Arrow from being launched--and save the world in the process.